As of the last week of July 2016, the US Drought Monitor classifies most of Suffolk County as being in a severe drought. 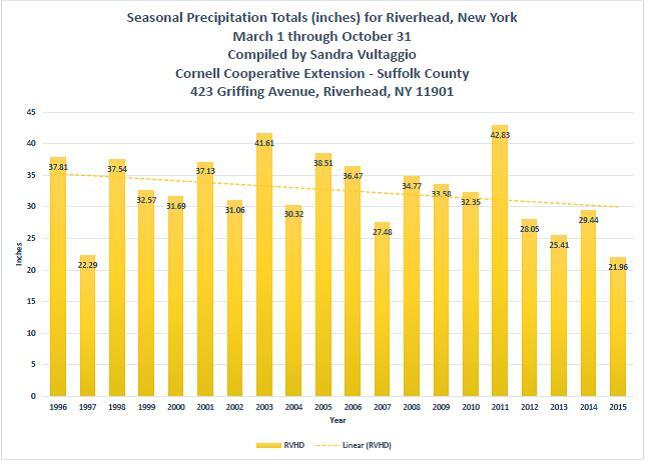 According to my precipitation records, Riverhead will need 10 inches of rain by the end of October to be on par with what we consider average. It’s currently raining, and let’s hope it keeps up! Mulch! Mulch everything! 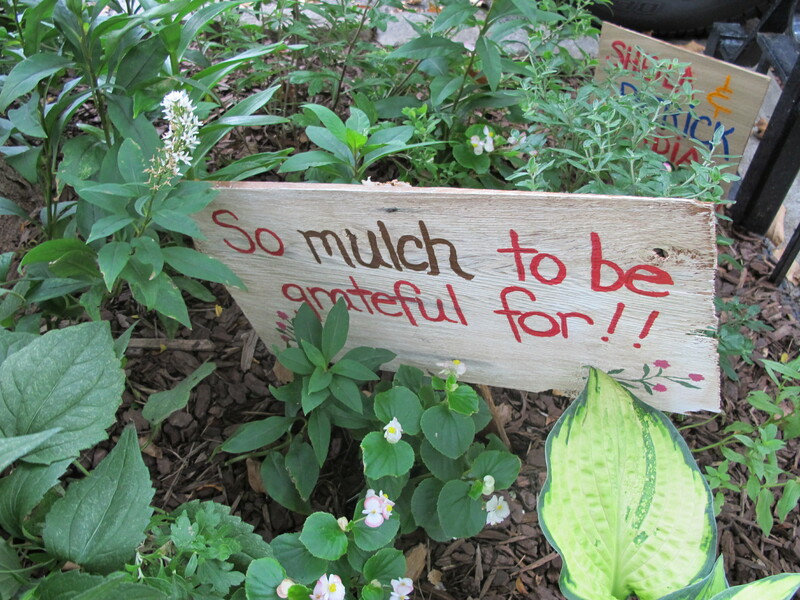 Mulch your landscapes beds, your flower pots, and your raised beds. Whether you use wood chips, straw, or grass clippings, mulch helps regulate soil temperatures and reduce evaporation. Providing a 3-inch mulch layer can reduce plant needs for irrigation by up to 50 percent. Review your choices for mulch by reading our fact sheet Types and Uses of Mulch in the Landscape. Plant early. If you’re planting new perennials, trees, and shrubs, plan to get them in the ground either in the fall or very early in the spring, as soon as the ground is workable. This gives plants more time to recover from transplanting and develop roots. Fall planting generally takes advantage of the season’s rainfall, but remember we’ve had very dry falls recently and many plants require irrigation until they go dormant. Warm-season vegetable plants, such as tomatoes and peppers, will still have to wait until spring nighttime temperatures are consistently above 45°F. Garden in raised beds. Planting vegetable gardens in raised beds gives you more control over their growth and water. You can amend the soil in raised beds more fully, creating environments where your soil holds moisture better. Soils rich with organic matter hold onto water and nutrients better than sandy soil. Weed. Keep your beds free of weeds. Not only do they compete with your plants for moisture, but they rob them of soil nutrients and sunshine if left to grow tall. Some weeds even serve as hosts to diseases and insects that prey on your plants. Water efficiently. Plants absorb water through their roots, so concentrating irrigation in the soil zone is crucial. Avoid overhead watering from sprinklers as these are not as efficient as soaker hoses and drip irrigation, and foliage wetness often exacerbates fungal diseases. Drip irrigation can reduce watering needs by up to half. The key to healthy plants is deep, infrequent watering. Try to water in the morning when the natural dew is set. Morning temperatures are cooler and evaporation is lower. Monitor your plants. Not everything needs supplemental irrigation. If your established landscape doesn’t show signs of drought stress, assume that the plants are finding water. Put the right plant in the right place. 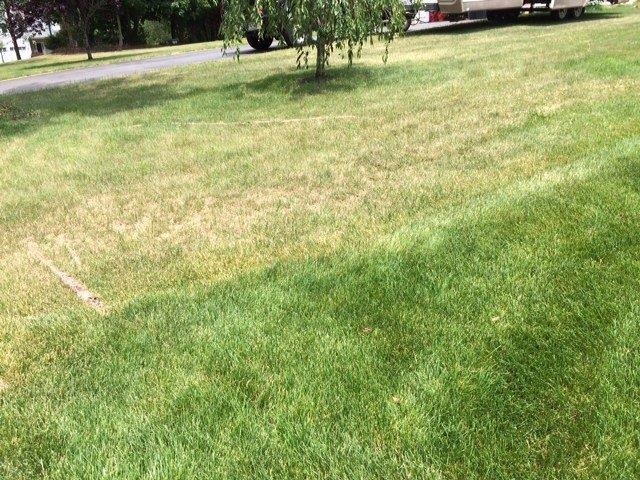 If established trees and shrubs are struggling with this drought, they are probably planted in the wrong spot. For example, Japanese cut leaf maples and flowering dogwoods are understory trees. They enjoy morning sun and shade throughout the hot hours of the day but are often poorly planted in the middle of a hot lawn. Take care to site plants where they will perform their best. Recycle your water. If you boil water for pasta, or you have some water left in a drinking glass, collect that water in a bucket to be used in the garden. Once you become aware of wasteful water usage, you’ll quickly discover ways to conserve and recycle. Information on drought-tolerant plants and more can be found on our website in this brochure: Waterwise Gardening. This entry was posted in Lawn care, Long Island gardening, Sustainable landscapes, Waterwise gardening and tagged dormant grasses, drip irrigation, drought stress, irrigation, Long Island gardening, mulch, rainfall, raised bed gardening, recycle water, right plant right place, soaker hoses, watering lawns, weeds on July 29, 2016 by Robin Simmen.